Catalina This set defines a design complementing two of our popular brands, Berwick and Grant; creating a distinctive curve with a charm all its own. A balance of beauty and beast. E&S-CL PANEL BED King E&S-CLPBK: 83"w x 54"h x 84½"l Queen E&S-CLPBQ: 67"w x 54"h x 84½"l Full E&S-CLPBF: 61"w x 54"h x 79½"l This bed comes with heavy duty hardware for easy assembly and a 30" high footboard. Additional Catalina Furniture Not Pictured: E&S-CL1DONS 1 Drawer Open NIGHT STAND 29½"w x 16"d x 28¼"h Features 1 standard 5/8" dovetailed drawer box and an open storage area beneath. 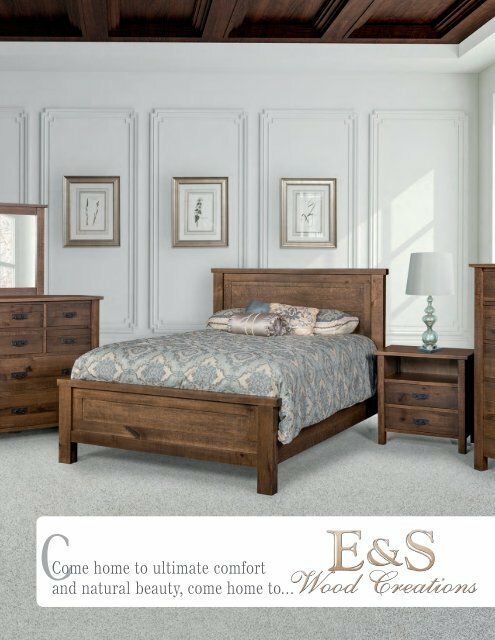 36 E&S Wood Creations Available in Oak, Quartersawn White Oak, Rustic Quartersawn White Oak, Brown Maple, Hard Maple, Cherry, Rustic Cherry, Hickory, Rustic Hickory, Walnut, and Grey Elm Shown in Oak with Stained Coffee stain. Harware K525-961 and 5525 DBAC. Page 51 and 52: Kashima E&S-KAM MIRROR 38¼"w x 42"
Page 53 and 54: Lynndale E&S-LD7M MIRROR 43"w x 41"